A completely configured system at a great price. With a fast Intel Dual Core processor and plenty of power, you'll be up and running in no time. Trust us, you'll feel liberated! Buy this system if you plan on having one computer in your store or if you want to add another computer to an already existing multi-computer network. Fully configured with all the necessary drivers to get you up and running. We've taken away all your headaches and decisions by combining the leading personal computer maker with the industry leading consignment software program on the market. Just open the box and plug it in and you'll be ready to go. No need to figure out what kind of computer you should buy and no need to hire a tech to help you figure out how to hook up all those peripherals (you know, printers and all that stuff). We've completely preconfigured this system so that it's ready to run, period. Seriously, just plug it in!!! The OptiPlex line is designed to be the smart choice for small businesses. We decided on this space saving model with awesome performance to meet your current needs and in the future. 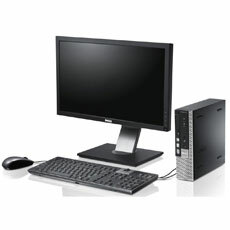 Dell performs extensive reliability and compatibility tests to help ensure smooth interoperability. OptiPlex incorporates extensive industry-standard systems management capabilities into every desktop.